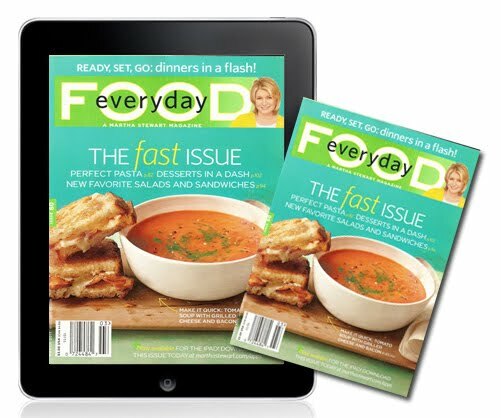 We knew it was only a matter of time before Everyday Food joined the group of Martha Stewart Living digital magazines for the iPad. (The magazine already has an application for the iPhone.) In the March issue (cover shown below) there are several ads for the new app, which will be available for download February 21 by clicking here. This issue, which I have propped here in my lap, is devoted to getting meals done fast, filled with wonderful new takes on pasta, quick-and-easy desserts (and slow-cooker brownies!) plus salads, side dishes and more. The digital issue will include lots of bonus material, such as cooking videos from the food editors filled with insider advice and quick tips, step-by-step slide shows of recipes and how-tos and before-and-after shots of dishes and ingredient swaps that make the delicious recipes come to life. The App itself is free to download. Once installed, readers will automatically be able to download the January/February issue for free, and will also have the option of purchasing the March digital issue for $2.99. So exciting. I can not wait to get it on my ipad. Can't wait! Just love that. I have a question regarding the magazine on the iPad. Is it like iTunes, where you purchase the product and you can only use it on that machine (i'm exlduing transferring between iPhones or iPods), or the Kindle, where you purchase a book and then can download it onto any device? i'm hoping it's like the Kindle because you then have the magazine forever, for the life of the device, and you can transfer onto any future device. For now the content is only for the iPad and is not transferrable to any other Apple device. Some of the video content from the Apps can be viewed online at MarthaStewart.com, however. Thanks for the answer. Say your iPad breaks. You get a new one. Are you able to download previoulsy purchased issues from the clouds, like a Kindle book purchase, or would you have to buy them again? I will still need to pay for the same issue to see it on the iPad? Same content but with bonus videos, extra tips, new links and more online goodies - if that's something you're interested in.